The Narrative Evolution portfolio showcases services ranging from strategic planning and copywriting to marketing and media relations. The result: your audiences will know your story across multiple channels and from a perspective that resonates with them. The Dallas Entrepreneur Center has added one more location to its universe with the grand opening of the DEC @ Redbird on Thursday, Nov. 1, at a party that saw more than 500 attendees enter the 7,300 square foot space on the second floor of Southwest Center Mall. To add to the celebratory mood, DEC leadership and Bank of America, a corporate sponsor for the DEC @ Redbird, announced that the financial institution was giving the DEC $200,000 as an awardee of the Bank of America Neighborhood Builders program. Shortly after the not guilty verdict was returned in the Trayvon Martin case, recovering politico and public health professional Kevin Dedner, sick with sadness, fury, and grief, turned to his circle of friends and family members to check in on them…Instead of being discouraged, Dedner turned to his friend and Dallas-based angel investor Oliver Sims, III and the two launched Henry Health, a health and wellness platform designed to make access to mental healthcare easy and convenient. Last month, two local membership organizations, Public Relations Society of America (Dallas Chapter) and ColorComm Dallas, hosted one of Uber’s top executives in town for a special community event. Bernard Coleman III, global head of diversity and inclusion (D&I), served as the keynote speaker for PRSA’s award-winning event, Drinks and Diversity Mixer. Coleman is based out of Uber’s San Francisco headquarters, so we thought his trek to the Big D was the perfect time to connect. Nearly two months in and the DEC’s CEO Alyce Alston sounds like a woman who has found purchase in the shifting sands underneath her feet. In an environment where many are decrying the death of brick and mortar storefronts, Julian Addo is leaning into the in-person shopping experience. Dawn Dickson knows a few things about bootstrapping. The serial entrepreneur from Columbus, Ohio began her career before the cottage industry of self-help guides and advice books from successful entrepreneurs took off. On a side road, in an unassuming warehouse near Addison Airport, the lean team at Hand Drawn Pressing is producing 3,000 vinyl records per day. The company is part of a international resurgence of vinyl production and sales. The Spaces coworking concept originated in Amsterdam, built on the idea that success breeds more success. The locations are more than just a place to plug your laptop; the international community culture is cultivated with members that include GitHub, GoPro, and Oracle. Ever since the announcement last year that Capital Factory was launching a Dallas location, the local tech and startup scene has been buzzing about what the expansion would look like and why the move to North Texas. Downtown and Uptown in Dallas has long been known as the place to go for a night out, but there is a new contender for hosting the best night out any day of the week. Big Beat Dallas, a multi-venue destination that boasts five restaurants and bars surrounding the Texas Lottery Plaza in the middle of Toyota Music Factory in Irving, has already made its mark on the nightlife scene. As an accountant-turned-product development specialist, Snag My Wedding CEO Tammy Bowser is a stickler for process improvement and eliminating waste along the business production line. These skills have served her well in her corporate career, but Tammy is also a curious creative. Ask the Expert: How Do I Hire Public Relations Support? You have the best idea, product, or service, and the world must know about it. It’s time to work to work with a communications professional. But do you hire internally, or work with an agency? What about freelance professionals? Plus, now you need to know best tips on hiring and evaluating. Don’t allow the idea of working with PR and marketing overwhelm you to the point that you miss out on valuable media coverage, partnerships, content development and sales opportunities. “I get emotional every time I talk about this,” said Necole Kane. Standing in front of an audience of 200 women on a rainy Saturday morning in downtown Dallas, Necole Kane appears shier than her previous alter ego would suggest. The newest business hotspot in Irving, TX, isn’t located in Las Colinas but right outside of old downtown, just past a transmission shop-turned-fountain and next to City Hall on Irving Boulevard. For many vendors at the Re-Imagine RedBird Pop-Up Market, the blossoming revitalization and investment in the region, spearheaded by the Dallas Regional Chamber, Dallas Entrepreneur Center and the Red Bird Mall redevelopment team, is bringing much-needed excitement and interest in Southern Dallas. Trying to find cute clothes that fit when you’re a girl that’s 5’9″ can be annoying, but trying to find cute clothes that fit when you’re a girl that’s 6’4″ can be a downright hassle. 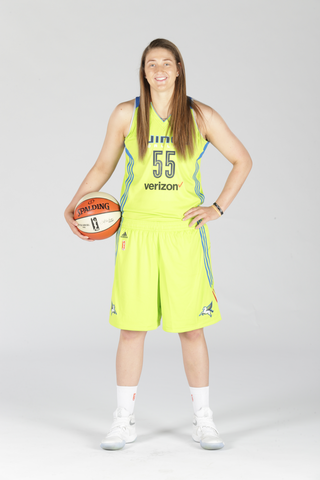 WNBA team Dallas Wings players Courtney Paris and Theresa Plaisance are two of the tallest players on their team, measuring in at 6’4″ and 6’5″, respectively. The average American woman is 5’4″ tall. Coaching can be a stressful business, but Dallas Wings Assistant Coach Bridget Pettis has a way of dealing with it, along with any other type of stress life has to offer. Step onto the WNBA Dallas Wings court during practice and you’ll experience various sights and sounds: squeaking shoe soles and the shouts of plays being called up and down the court as players run drills with focused intensity. The physicality and drama of basketball may seem like a diametrical opposite experience to the fluidity of yoga, where there is no jostling for position under a net and practitioners stay within the four corners of their mat. For Dallas Wings Assistant Coach Bridget Pettis, there is no separating the two worlds. Partners Pam Gerber and Suzanne Slonim may be relatively new fans of the WNBA and the Dallas Wings. But there aren’t many fans who are more fervent. As the team and their fans — including Gerber and Slonim — gear up Dallas Wings Pride Night on June 16, the couple took a few minutes to talk about why they love Dallas Wings and why they think everyone else should, too. 2016 was thought to be the year of the woman, but we’d like to go ahead and nominate 2017 thanks to amazing organizations that support and celebrate women in a big way. Dallas Wings forward Theresa Plaisance joins Good Day to talk about the team's home opener this weekend. It's a game against the defending champs. Let us be the first to share the best kept secret in North Texas – the WNBA Dallas Wings, who are tipping off their second season on Saturday, May 20 at 7 p.m. at College Park Center against the Minnesota Lynx. The team has been busy expanding their ever growing legion of fans during the offseason after adding five draft picks in this year’s WNBA Draft, including two players who won the Women’s NCAA national championship in Dallas. This video will show you the step-by-step instructions on how to open a TollTag account online. TollTag customers save money on toll roads - ZipCash customers pay at least 50% more - and can easily pay for tolls without stopping in Texas and Oklahoma.